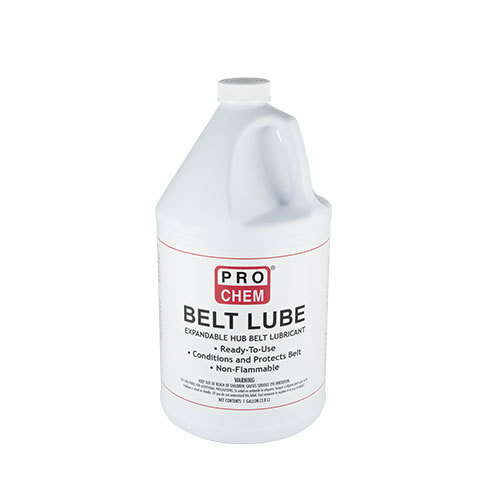 Belt Lube | Pro Chem, Inc.
BELT LUBE guards against the damage caused by ultraviolet rays, environmental conditions and everyday use. This product helps belts resist cracking, dulling, hardening and fading and increases pliability. Its protective shield helps maintain a long lasting attractive appearance on a variety of surfaces that is non-greasy and long lasting. BELT LUBE also makes surfaces anti-static to repel dust and dirt. Apply with a swab and bucket. Cover a strip 3” and 8 mm wide at each belt edge along the rim flanges. At least once a week, clean the belt on the expandable rims with a wire brush, a putty knife and a clean shop cloth. A brass, non-sparking putty knife is recommended to avoid scratching the aluminum parts. Apply a little at a time to inner surface of belt while machinery is in motion. Spray using a back and forth motion until the surface is completely wet. On most belts, the spray may be applied to the sheaves, pulleys or directly onto the belt itself. Repeat application occasionally to maintain full power and optimize belt life. NOTE: In many instances, protective guards must be removed in order to apply belt dressing properly. In such cases, please use extreme care to prevent accidents. Be sure to replace guards after treatment. CAUTION: Use only as directed. Avoid overspray onto floors, equipment controls or any surface which may become hazardous if slippery.